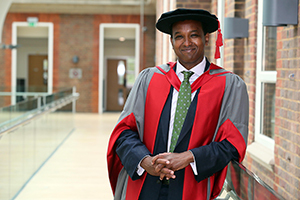 ITV's International Affairs Editor, Rageh Omaar, has been awarded an honorary degree by Middlesex University. The journalist and broadcaster has covered some of the biggest news stories in the world - from the invasion of Iraq (where he reported for the BBC from a rooftop in the city of Baghdad) to the invasion of Afghanistan (where he reported from inside Taliban-held Kabul). Mr Omaar won a Bafta for his coverage of the situation in Kabul. His work in Darfur also earned him a Peabody Award. He currently presents On Assignment, ITV's new current affairs programme. Previous roles include Senior Foreign Correspondent for the BBC, presenting investigative programmes and documentaries for Al Jazeera English, and reporting for Channel 4's Dispatches. Last year, he also presented a BBC series on the Ottoman Empire, which was the subject of a Middlesex University debate. In addition to his broadcasting work, Mr Omaar has written two books; Revolution Day: The Real Story of the Battle for Iraq, and Only Half of Me: Being a Muslim in Britain. Middlesex University Vice-Chancellor Professor Michael Driscoll said: "Rageh Omaar's bravery, tenacity and intelligent reporting have shone a light on some of the most significant international events of our time. We are delighted to be able to present him with this award."